It's official. Notre Dame is back on the schedule. 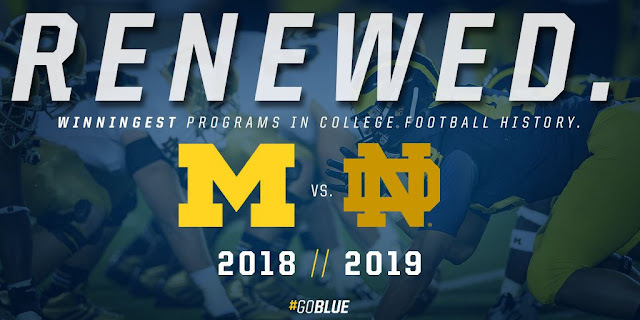 The Irish will host the Wolverines at Notre Dame Stadium in the season opener on Sept. 1, 2018, with a return trip to Michigan Stadium scheduled for Oct. 26, 2019. So in 2018, Michigan will travel to South Bend, East Lansing and Columbus all in the same season. Clearly, this is sub-optimal on many fronts, but does create a 2019 schedule where all 3 rivals appear on the home schedule. This is a by-product of the gutless Brandon era...which is how we ended up with the series disappearing in the first place. Michigan must do anything and everything they can to get the Michigan State home game back on even years ASAP. To make room for the return of the rivalry with the Irish, the Wolverines have come to an agreement with the University of Arkansas to cancel the series and will fulfill the obligations set forth in the contract. The Big Ten Conference home game against Rutgers, currently scheduled for Oct. 26, will move to the open date on Sept. 28, 2019. So the first paragraph of the Manuel quote pertains to why Michigan did what they did in terms of scheduling the home/away aspect of this. 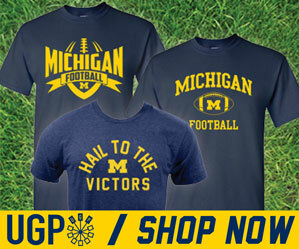 Michigan clearly favors 7 home games a year. 2019 already has 5 away games on the schedule. And even though flipping it gives Michigan 14 home games between both 2018-19 seasons either way...I think from a season ticket sales perspective, the 7 home-game threshold is a deal breaker. Odd to have the Irish so late on the 2019 schedule. But I assume this was unavoidable to a certain degree.